I worked as an art therapist for the Borough of Brent, setting up a department for mentally ill adults until I had my first child. 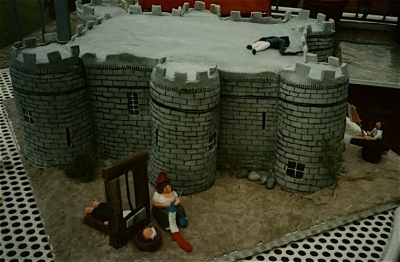 I later ran a cake-making business from home for about 20 years, making a great many celebration cakes etc- edible art! These included [almost life size] a schoolgirl for a local school, 'The Storming of the Bastille' for the British Museum's bi-centenary party, a Beryl Cook tribute birthday cake, a 'shoe wedding cake' representing bride & groom, [all pictured] and a giant speculum for a nurse's birthday. I have been working as a home carer for Camden Social Services for the last 10 years and I am currently working in oils and mixed media on a series of paintings about Birth which has been gestating for several years. These include 'Rebirth' [pictured], 'Mother of Thousands', 'Mother of All' and 'The Bun Coming out of the Oven', inspired by, among other things, cake-making, primitive statues, Frida Kahlo and black madonnas. If any of my pictures are sold, I shall make a donation to the 'White Ribbon Alliance' which helps women in very poor countries giving birth under terrible conditions.